The British Beard Club invites prospective members to help to create it. Since the World Beard and Moustache Championships event was held in Brighton, East Sussex, on September 1st 2007, British beard growers, owners and their admirers have discovered that there has been no social club for British men with an interest in growing their beards. David is hoping to attend the December 5th First Friday at The Windsor Castle to meet potential new members. Another Bacchalian adventure takes Andy Lear and the Team into the world of Sambucas, Moonshine and Swords, in his latest saga of the Club's visit to and participation in the European Beard and Moustache Championships in Leinfelden-Echterdingenin, Germany. But there's nothing about what he ate and drank there ... ONLY JOKING! 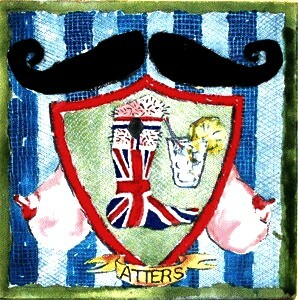 Atters' moustache inspired artwork auctioned as part of the Stars on Canvas project. Committee member Michael "Atters" Attree is having his moustache inspired artwork auctioned as part of the Stars on Canvas project in aid of the Willow Foundation (a national charity that provides special days for seriously-ill 16 to 40 year olds throughout the UK). You can bid directly online for Atters' work until December 12 via E-bay (at: http://cgi.ebay.co.uk/ws/eBayISAPI.dll?ViewItem&ssPageName=STRK:MESCX:IT&item=180307953885 ) or bid for other canvases (possibly more suited to your tastes) created by a host of actors, artists, cartoonists, chefs, children's illustrators, politicians and radio and television personalities. 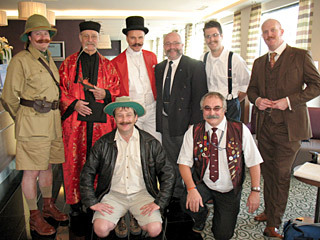 Can you spot at least 12 members of The Handlebar Club who were competitors at The European Beard Championships 2008? Although only recently becoming a member of the Handlebar Club, Brian, known as 'Whiskers' to his nine grandchildren, was a lifelong proponent of the hirsute appendage. Its graspability was something of a family legend and an ever-present source of inspiration to his nephew who went on to become our current Club Secretary. Due to illness Brian was unable to attend any of our club events over the last couple of years but often wore his club regalia with pride in his adopted county of Somerset. He will be sadly missed by family and friends. 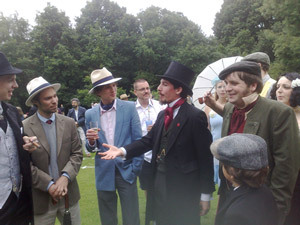 Our intrepid reporter Andy Lear tries his hand at the Cucumber Sandwich Discus, despite an initial and serious lack of refreshment, but Handlebar Club member Dave Hill arrives in the nick of time with the requisite beer but no iPod. The Hundred Yard Saunter typifies the athletic style required for this event organised (some might say) by the The Chap Magazine. Andy mistakes the Compere for an Elephant - Specsavers? Read yet another Andy Lear headlong stream-of-consiousness account of the Club's visit to and participation in the Bremerton, Washington State event. Yes, and of course, about what he ate and drank there! Frank Miles of Toronto, Canada writes to us with this tribute to his late uncle, George Hoffman, who joined the Handlebar Club in 1947. 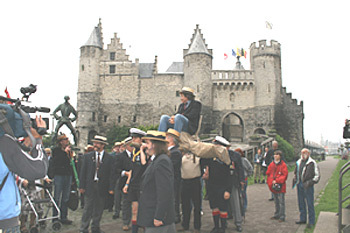 Read another Andy Lear account of happenings during the Antwerp Moustache of the Year 2008 event, and what he ate and drank there. Read Andy Lear's entertaining account of happenings during the Handlebar Club's 2008 AGM at the Hythe Imperial Hotel, Kent, and the members' visit to bleak Dungeness Lighthouse riding the RHDR. UPDATE! 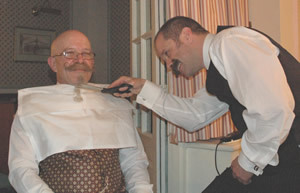 Alan Rockliffe's loss of face (-ial hair) raised £355.02 for The Multiple Sclerosis Society, a charity close to his heart. with the cheque for £6,250. 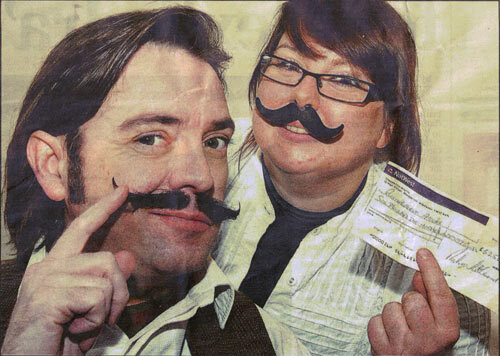 A CHARITY has received an unlikely boost after a display of artistic facial hair. The World Beard and Moustache Championships, held in September last year at the Brighton Centre, featured dozens of beard and moustache wearers. The event was organised by the Handlebar Club, which raised more than £12,000 for charity. Now renowned Brighton moustache wearer Michael "Atters" Attree, a member of the Handlebar Club, has presented a cheque for £6,250 to the Rockinghorse Appeal. The appeal raises money to help sick children, including patients at the Royal Alexandra Children's Hospital in Brighton. The rest of the cash was donated to the Everyman Male Cancer Campaign. Conway had been a member of the Club since the early days, went out to Canada for a few years then rejoined on his return in the mid 1950s. Since then he has been a leading figure, not only in the Handlebar Club but in other clubs throughout Europe. He served on the committee for years in various positions and having retired about 10 years ago, came out of retirement to be President during our 60th Anniversary year and for the World Beard and Moustache Championships. Our thoughts go out to Rosemary, his wife and his brother Chris, his sister Ann and their families. 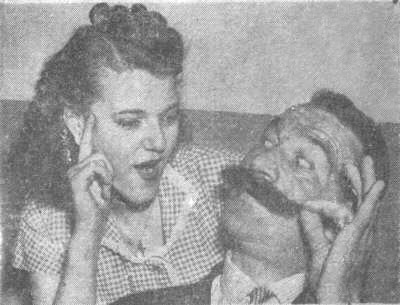 One (short) time member of the Handlebar Club, Ed Ryland, has won the Darlow Smithson Short Film Competition 2007 with his documentary Mr.Moustachio - a film about his attempt to grow a handlebar moustache and to join our esteemed band. The competition was run by a documentary film company called Darlow Smithson (who made Touching The Void). Ed is now considering entering his film for another couple of film festivals and negotiating its appearance on the small screen. Mr Ryland, who tells me that he "rather carelessly shaved off the moustache" would like to thank members of the club for their help and hospitality during the making of the film. Ed also made the film Grow a Tache. Raise Cash. 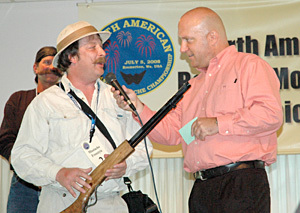 for Tacheback 2007 which appears elsewhere on this site.